*Christine* (Vaporvent Records – CA/ Mandala Records- France) Christine Webb is a California-based Seattle native that fell in love with psychedelic trance music in the late 90s. Christine was so captivated by psychedelic trance that in 2000 she moved to the hub of the West Coast's largest psy-trance scene, the San Francisco Bay area. In 2001 she has completed the FCC class and training to receive her FCC license and hosted a late night ambient college radio show, Sedation Vibration on KZSC Santa Cruz. spinning mellow chill out and dreamy atmospheric downtempo. 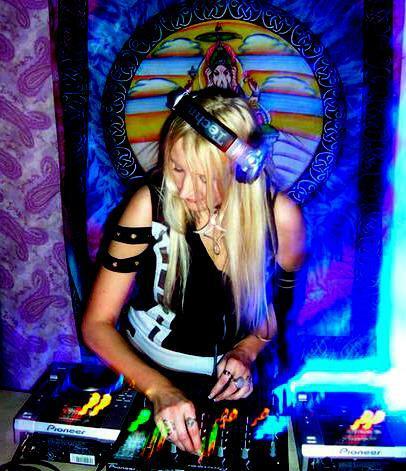 Christine than went on to co-host the psy-trance radio show "Highway 604," she threw parties at the "Santa Cruz Trance Mansion", and has spun in countless parties within the bay area & the United States & around the world. In 2004 was asked to join Vaporvent Records as a label DJ and artist & in 2007 she also joined with Mandala Records (France)as a label dj. She has played clubs and festivals across North America & Mexico, headling with such acts as: Hallucinogen/Shpongle, X-Dream, Sirius Isness, CPU, GMS, Atomic Pulse, Dino Psaras, Mekkanikka, Earthling, Paul Taylor, Wizzy Noise, D-tek, Neuromotor, Joti Sidhu, Chromatone, Eskimo, Hujaboy, Silicon Sound, Protoculture, Jaia, Vibrasphere, Ace Ventura + many more. Her music collection ranges from full-on trance to harder psy night time stompers. No matter what genre, she spins the hottest, freshest tunes, out at that time & always gets the dance floor moving.